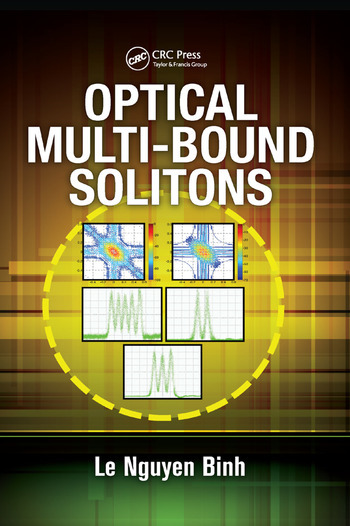 Optical Multi-Bound Solitons provides extensive coverage of multi-bound solitons from the dynamics of their formation to their transmission over guided optical media. Appendices are included to supplement a number of essential definitions, mathematical representations, and derivations, making this book an ideal theoretical reference text as well as a practical professional guidebook. Le Nguyen Binh holds a B.Eng (Hons) and Ph.D from the University of Western Australia. He is currently a technical director at Huawei’s European Research Centre in Munich, Germany, and has been awarded three Huawei Technologies Gold Medals for his work on advanced optical communication technologies. He was previously the chair of Commission D (Electronics and Photonics) of the National Committee for Radio Sciences of the Australian Academy of Sciences, and a professorial fellow at Nanyang Technological University, Christian-Albrechts-Universität zu Kiel, and various Australian universities. Widely published, Dr. Binh is the series editor of Photonics and Optics for CRC Press. "The author gives a very clear and useful description of nonlinear systems in terms of their fundamental principles, associated phenomena and signal processing applications for communications and laser systems. The book is a valuable addition to the field’s literature and complements other existing works. I would recommend this book especially to young researchers—they can learn about scientific results along with applications in optical communications. It also provides insight into developing original strategies when working with the difficult mathematical problems arising in chaos and solitons in complex systems."